The Israeli assault on Gaza has killed 200 people. Most of whom are civilians and children. Thousands more have been forced to flee their homes under threat from the Israeli government. The short ceasefire announced for this morning is a welcome development. However it will only be another temporary lull in the cyclical violence in that region unless a real and inclusive dialogue takes place involving all of the combatant groups, including Hamas, and if the core issues of statehood for the Palestinian people, an end to the Israeli theft of Palestinian land and water rights, and the lifting of the siege of Gaza are not agreed. Imagine that the population of the north was squeezed into an area half that of County Louth, the smallest county on the island of Ireland. Imagine that 1.8 million people are locked into a piece of land that stretches roughly 40 kilometres from the border to Drogheda and is roughly 10 kilometres wide. Imagine that 80% of the people who live there are dependent on some form of food and clothes aid. Imagine that over 80% live below the poverty line. Imagine that unemployment is 44%, and that 58% of young people between the ages of 15-29 have no work. Imagine that 52% of women have no work. Imagine that electricity is unpredictable and frequently fails. Imagine that the health system is unable to cope and does not have access to modern equipment and the medical drugs and treatments others take for granted. Imagine that 10% of children under five have had their growth stunted by malnutrition. Imagine that anaemia is widespread, affecting over two-thirds of infants, 58.6 per cent of schoolchildren and over a third of pregnant mothers. Imagine that most of the sewage sites are overflowing and the system is close to collapse, and that 3.5 million cubic feet of raw sewage is finding its way into the Irish Sea every day. Imagine that there is little rainfall and that most drinking water comes from ground wells. Imagine that you know that in six years time they will all run dry. There will be no drinking water. If your imagination is up to the task you have just imagined the harsh reality of life for almost two million men, women and children living in the Gaza strip. But even that doesn’t tell the whole story. Myself and several colleagues visited Gaza five years ago in 2009. It was just after the Israeli ground invasion. By the time the Israelis left the economy of Gaza was shattered. 3,500 homes had been destroyed; another 28,000 damaged; 800 industries were damaged or destroyed; 10 schools were destroyed and 204 damaged. 1440 people had been killed, including 114 women and 431 children. 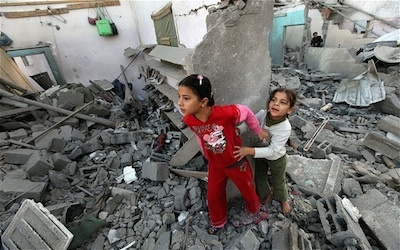 In 2012 there were further Israeli attacks on Gaza. In November of that year 161 Palestinians, including 71 civilians were killed. The then Israeli defence minister, Ehud Barak, justified the assault claiming that: “All our objectives were reached, taking out the Fajr rockets, rocket launching pads and Hamas offices”. Less than two years later and the Israeli Defense Forces claim that Hamas now has 10,000 rockets! How? What happened to Barak’s claims? For Palestinians the reality is that they are stateless. They are a nation without a settled piece of secure territory they can call their own. Millions live in refugee camps. Many have done so for over sixty years and many millions more are scattered around that region and the world. The Separation Wall erected by the Israelis has seen huge chunks of Palestinian land and water rights stolen. Illegal Israeli settlements containing over 100,000 illegal settlers occupy Palestinian land on the west Bank. Should we be surprised then when violence erupts? The last week the Israeli assault on Gaza has left almost 200 Palestinians dead. Once again it is the civilian population that is being collectively punished by the Israeli state. 75% of those killed have been civilians. Just over a quarter have been children. Some of the images that have appeared on the internet of children have been horrifying and deeply upsetting. But the impact of the Israeli assault extends beyond the dead and injured. Gaza relies on wells for drinking water. At the weekend Palestinian officials were accusing the Israeli military of deliberately targeting wells in Gaza City, as well as water pipelines. Thousands of families have been left without access to clean drinking water. This is especially critical in a region where one Oxfam official said that 90 percent of the water in Gaza was already unsafe to drink. In January 2013 the EU Heads of Mission Jerusalem Report 2012 was published. It was a scathing indictment of the Israeli government’s flouting of international law and it’s violation of the rights of Palestinian citizens living in East Jerusalem and the occupied territories. The EU report accused the Israeli government of implementing a settlement policy that is ‘systematic, deliberate and provocative’ and of pursuing a deliberate policy of seeking to drive Palestinians out of East Jerusalem. The Jerusalem Report indicted Israel for violating ‘international humanitarian law’. The Palestinian people have been robbed of their land, imprisoned by separation walls and borders into ghettoes, and have little power or influence. Israel by comparison is a first world, highly developed, rich and heavily armed super-state with nuclear weapons. At some point there will be a ceasefire. But everyone knows it will only be a lull before another round of violence. Without a comprehensive peace accord that deals with all of the key issues of Palestinian self-determination and independence and of two states, as well as of economic issues and prisoners and land and water rights, no ceasefire will last long. Real progress toward a negotiated political settlement requires an end of armed actions by all of the combatant groups. That means an end to the rocket attacks from Gaza. It also means an end to Israeli aggression and its bombardment of the Gaza Strip which has caused enormous suffering. It also means lifting the blockade of Gaza. But perhaps most important it needs the international community to stop standing by while Gaza and the Palestinian people are again pounded back to the stone age by the might of the Government of Israel.